High-Performance Braided Shielding and Sleeving for EMI/RFI Screening and Mechanical Protection in Cable Assemblies. 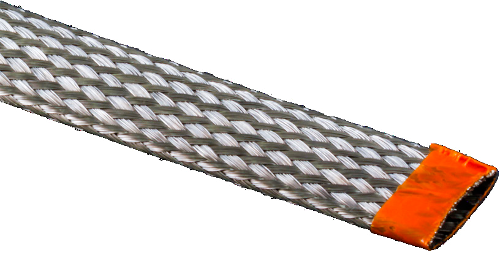 The world's most innovative line of metal, monofilament non-metallic, and microfilament composite and stainless steel braiding solutions for environmental, mechanical, and EMC shielding in interconnect cable assemblies. Save weight and money every time you fly! All-Up-Weight (AUW) has met its match: ArmorLite™ microfilament stainless steel braid saves pounds compared to standard QQ-B-575/A-A-59569 EMI/RFI shielding. ArmorLite™ is an expandable, flexible, highstrength, conductive stainless steel microfilament braid material designed for use as EMI/RFI shielding in high-performance wire interconnect systems. The principal benefit of ArmorLite™ is its extreme light weight compared to conventional nickel/copper shielding. By way of comparison, 100 feet of 5/8 inch ArmorLite™ is more than four pounds lighter than standard 575 A-A-59569 shielding. Plus, ArmorLite™ offers superior temperature tolerance compared to other lightweight tubular braided shielding including microfilament composite technologies. For many applications, the cable shield is the most important element in controlling EMI. Unfortunately, metal shielding – especially when applied in multiple layers – can be extremely heavy. The opportunity to provide robust EMI shielding at a fraction of the weight is the principal advantage of composite thermoplastic EMI/RFI braid made from AmberStrand® material. Transfer impedance test reports demonstrate the effectiveness of the material compared to conventional metal solutions. So get smart! Reduce weight and save money with AmberStrand®. For conventional electrical wire interconnect system applications that do not require weight savings or the other performance improvements of ArmorLite™ or AmberStrand® materials, Glenair offers qualified tin-plated copper, nickel-plated copper, and other tubular sleeving solutions.